Recently this printed booklet has shown up on Ebay as a hard-to-find collector’s item sought after by Max Payne fans and collectors. With Social Club members from the US to the UK and beyond trying to hustle one up, Rockstar has "found" 50 of them that they've set aside for a special giveaway for fans. 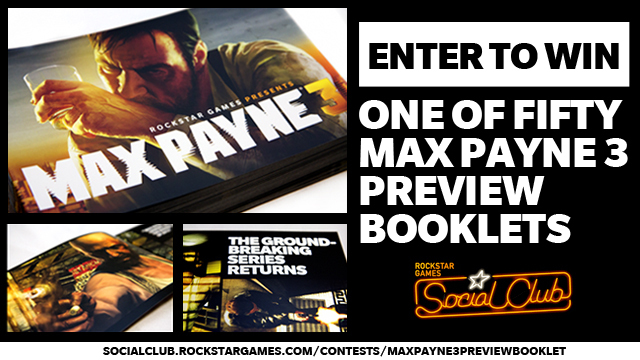 The Max Payne 3 preview booklet was created to inform fans and retailers about the highly-anticipated return of Max Payne and features fourteen cover stock quality pages that are loaded with original full color artwork and in-game screens, along with technical highlights, story notes, and more. Visit the contest page at the Social Club to enter for the chance to score one and for Official Rules and details – you’ve only got until Friday, February 24th, 2012 to enter. The prize winners will be chosen at random and announced sometime in early March. Don’t have a Social Club account? Signing up is easy and free, and you’ll get access to exclusive unlockable game content, multiplayer events, stat tracking, progress checklists and much, much more! Join us at the Grand Theft Auto V forums!